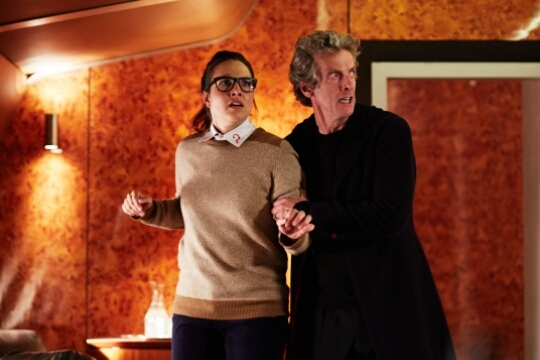 If you haven’t guessed by now The Zygon’s are back and I am really happy for their return. Since the 1975 Tom Baker story Terror of the Zygons, I have always wanted to see The Zygons return. After they appeared in The Day of the Doctor I had a feeling we would be seeing them again as they would want to use those expensive costumes again. What I didn’t expect and what has turned out to be a pretty good idea, is that The Zygon Invasion is a loosely based sequel to the 50th Anniversary story as it builds upon the peace treaty between The Zygons and the humans. I really liked the idea of continuing the story from The Day of the Doctor. They could have just left it as it is but they decided to expand on it and so far they have come away with a pretty good first-part to this two-part Zygon story. I like how they set it all up with the two Osgoods who are protecting the peace; with a solution if the peace is not kept. I also liked the explanation of the two Osgoods and what happened to the other when she found out her sister had been killed. It is also a pretty clever plot device in not divulging which Osgood we have, as The Doctor says she is part human and Zygon – a type of hybrid. So far everything is being set-up pretty well in this story as The Doctor arrives to find things are getting out of hand. This story seemed to be pretty political in nature. I’m not an expert in UK politics but it was pretty plain to see that with 21 million Zygons on Earth did remind me a bit about the refugee crisis going on in Britain. Plus it also reminded me of the problem with terrorists, when you attack on off-shoot you make them martyrs, thus helping their cause. That was what The Doctor was trying to stop with the UNIT attack on the church. Doctor Who has always been political in the past and science fiction has always had a political message to it; you could say they go hand in hand. I’m not sure about the Zygon’s new power. They appear to now change into a person from your memories. Like the UNIT soldiers mom. They were able to convince him not to shot her even though all the facts pointed in the direction of the Zygons. I always thought they would need the humans alive to keep the pattern but we also learned they only need them alive for information and once they get it they can kill the human off. Not sure if I like this new development as the old way made them more dangerous as they also kept your friend hostage also for a bargaining chip. I liked the fact we had three separate stories going on with Kate in New Mexico checking on the Zygons in Truth or Consequences. There wasn’t much for her to do but get captured but if you are the leader of UNIT why would you go on assignment in high heels? Seems like an odd choice of footwear to choose when you are on the hunt for Zygon’s. I also like Clara’s part in all this. It was actually more interesting than what The Doctor was getting up to. We find out that Clara was indeed a Zygon named Bonnie. Loved the switch explanation as it made total sense, when she led UNIT into a trap killing them all. I enjoyed seeing an evil Clara, especially when she appears to have shot The Doctor’s plane down with a rocket launcher. That scene sets up the cliffhanger which is a pretty good one and will have the fans guessing all week. I really enjoyed The Zygon Invasion as it set up the next part nicely and it wasn’t at a fast pace either, which happens too often with Doctor Who stories of the 21st Century. It will be interesting to see what happens in the next part The Zygon Inversion as it has been awhile since they did an old style alien invasion story that uses a lot of paranoid feeling to make it scary.